Opening: Thursday, 11.7.2013, at 7:00 p.m.
29.07, 15:00-17:00 – Rachel Sukman, Head of Chair: "Inventing Identities in Jewish arts and architecture", 16th World Congress of Jewish studies, room 2716. Participants: Dr. Ilia Rodov, Dr. Sergey Kravtsov, Dr. Miriam Rajner, Dr. Sara Offenberg. 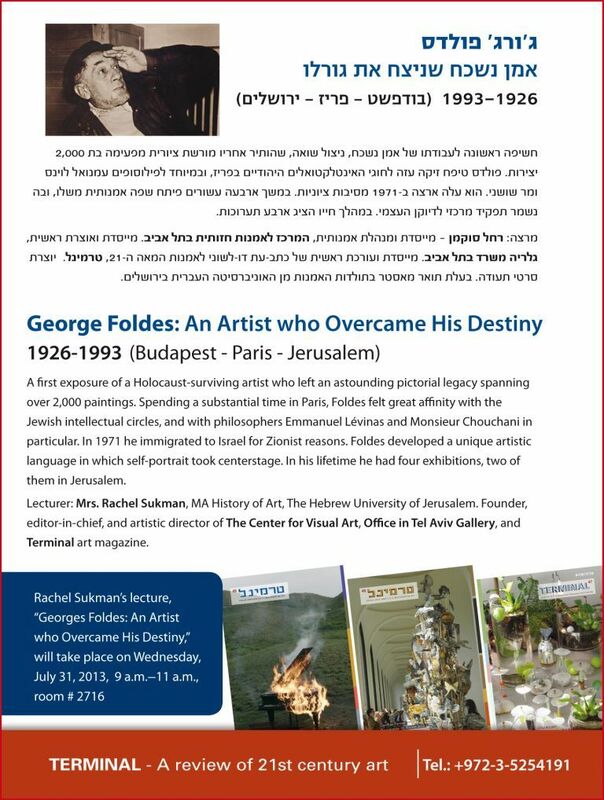 31.07, 09:00-11:00 – Rachel Sukman, Lecture: George Foldes: An Artist who Overcame his Destiny. 16th World Congress of Jewish studies, Hebrew University, Mount Scopus, Jerusalem. 31.07, 19:00-23:00 – Meeting of senior lecturers of Congress and editorial staff of Ars Judaica. 28.07-01.08 – "Terminal" magazine pavilion at the Hebrew University, Mount Scopus, Jerusalem, between the hours 09:00-19:30.